And here’s why: Errant Story is put together backwards. Also, it’s alive. 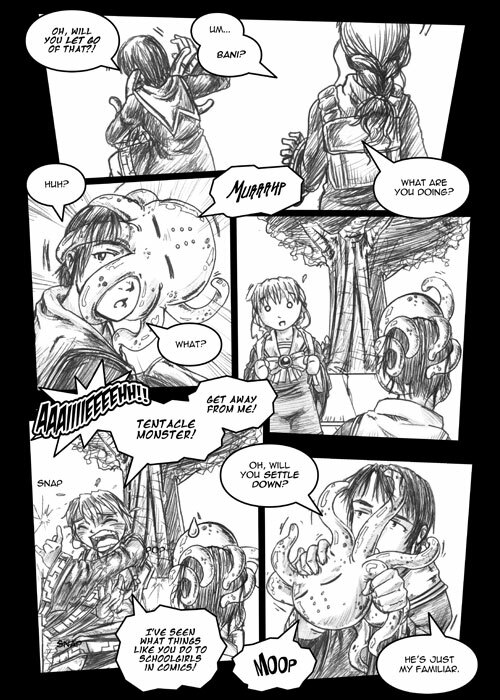 See, Errant Story is a finished webcomic, and on the web, it’s even already been published. But that didn’t happen in a clean step by step process the way it does for print comics, it happened one page at a time over a period of ten years. Poe took shortcuts, learned things on the fly, and made things up as he went along. In effect, Errant Story wasn’t made, it was grown. Now, however, we’re trying to take this organic, pulsing thing, and put it into books. And it didn’t grow for books, though it’s obvious that’s where it should be. It grew on the web, for the web, and some of the things Poe did way back when… they don’t work anymore. So in editing Errant Story for print, we’re not starting from scratch and building forward the way regular comic books do, we’re starting with a giant, fully-grown tree and trying to prune and replant it so that it comes out still looking like the same tree. Just better, and in a different spot. What, specifically, are we doing differently? Well, Step One of any comic should theoretically be a script, but Poe never wrote one. Instead he thumbnailed panels and jotted dialogue down in a sketchbook one page at a time, drew the pages, and then typed up the dialogue and lettered the comic roughly an hour before posting a page. Worse, he overwrote the dialogue in the same file every single time he lettered a new page, and for many years rasterized the text into pixel data in the art files, making it impossible to simply edit. This created a problem, namely that printing Errant Story would require relettering every page, and that leads to the first backwards step in our convoluted process. We had to start by creating a brand new script from the existing pages. We have a few amazing transcribers who painstakingly copy down the text from each original page into the script (did you know that there’s about 17,500 words per volume of Errant Story? ), and the result is the base script that gets chopped up for all the editing. In a way, this is also the first thing we’re doing wrong (aside from kindof the entirety of Poe’s initial approach to lettering). The industry standards for formatting a script vary between the major houses, but they consistently want you to output a script in Word. Guess what we did not do? Instead, I found an amazing program, called CeltX. I love this program, it has features that as an editor I simply could not function without. Formatting is done automatically with key commands, it recognizes pages of the comic as units and has a view where pages act like index cards that you can actually shuffle and rearrange, it offers color coding by plot arc (or in my case, by chapter, since that’s how I prefer to use it), it handles multi-script projects, and has built-in management for script elements like characters or settings. It can export as text, and can automatically reformat the script (which looks more like a movie script when you’re in editing mode, which is good for me because that’s what I’m most familiar with) into a PDF chart that breaks down each page by panels. I cannot fathom why anyone would ever want to script in Word when they could be using CeltX instead. It is now the only thing we use in-house, but, if we ever wanted to work with anyone else in the industry, we’d have to take all that lovely functionality and toss it in favor of a script formatted by hand in Word. That’s the price you pay when you need to be able to standardize across an entire industry… it’s very slow to adapt. We, on the other hand, are small and flexible. So, once the script has been created in CeltX, it’s time for the next backwards thing. I go through the script and make corrections to the text, note formatting issues, and basically make the text letterer-friendly. On the face of it, these are fairly normal things that usually happen to a script before it goes to the artist, but that’s exactly why this is backwards. All this text is edited in relation to existing art… mostly. It’d be nice if this process were that simple, but in addition to the basic cleanup, there are some more editorial decisions being made at this juncture. One of these is that Poe wants a more focused approach to the story in the books than happened when the story grew as a webcomic, so I’m shuffling some of the scenes to keep the main storyline at the forefront throughout each volume. This means that page counts and chapter breaks are changed. In a normal process, these decisions should definitely be made before any art is created, because the artist will justifiably kill you and defile your body if you attempt it halfway through… but that isn’t the case for Errant Story, home of the runaway text. Many of the pages don’t actually have room for all the text Poe originally crammed onto them, so unless we want to start hacking away dialogue, they have to be split. That means finding a natural break in the dialogue, determining how the existing art should be repurposed on the new pages, and deciding what new art is needed and where it should go. Fortunately, I’ve had a lot of time to get a good feel for how Poe lays out a page, so I’m able to keep this fairly consistent with his style as I visualize the finished pages. I also try to keep in mind which side of the book each page will go on, so that scenes break in ways that make sense within a chapter. Combined, these changes amount to approximately thirty extra pages of art per volume (which is why attempting this with any artist who isn’t the original creator would result in that artist defecating into your open wounds after slicing you up with a rabid koala). Having finally wrangled the wily scripts, though, I do yet another thing backwards. I reformat the original art for print, make whatever edits and page splits are called for, and letter the page despite the blank space where new art will go. After all this editing is done, I then I print the page on bristol paper so that Poe can work on it using the same tools he used for the original pages. How is that backwards? In a normal book, writing and editing goes first, art second, and lettering comes last, but Poe is very resistant to understanding that words take up space. Giving him pages where the lettering already exists helps him to account for it when he creates the new art, and puts the new art in context with the rest of the page it will appear on, which helps keep it somewhat more consistent. Remember, some of these pages are a decade old, and it’s really hard to go back in time as an artist, so the art guide helps reset his eyes for his old style. Oh, and this is yet another thing that we’re ultimately doing wrong, because all of that editing happens in Photoshop despite there being a million better ways to do it. I would love to learn to use those tools and switch, but Photoshop is comfortable, the files are already formatted for it, and we’re short on time so don’t want to spend a lot of it needlessly converting the pages to a format for tools we’re less adept at using. For this project, we’re just going with what we know, and since we’re working in-house we can get away with that. Ultimately, after all this backwards process, we end up with page after page of revised lettering and art, all divided into new chapters and new volumes. If we’ve done our job right, most of those pages won’t appear to be much different at all, and a new reader would never know we’d done anything. So why go through all this? Why spend all this time and energy doing absolutely everything backwards and wrong? Because when we do, Errant Story comes out right. This method would never work if we were creating new books from scratch, everyone involved would be going insane, but for Errant Story and the kind of evolution and growth we’re trying to bring out of it, this is the approach that takes what the comic was, and turns it into what it wants to be. To us, that’s worth it. After chattering about this subject a bit on Twitter, I thought I’d take a moment to discuss some of the things we’re doing differently in lettering Errant Story, and why we’re doing them that way. Before I get into this, I’d like to recommend reading Nate Piekos’s article about comic book lettering conventions, because it’s really important to know about the industry standards before you decide to go around subverting them. First and foremost, here’s the important thing to know about Errant Story: this is a work that is entirely handled in-house. That means that we do everything up until the files go to the printer, all the writing, all the art, all the lettering, all the editing, everything. Because we do that, and we don’t have umpteen different people putting their hands on this project who need to all be communicating in the same standardized language, we have the freedom to do things our way, even when our way isn’t the industry standard (or even, necessarily, the best way of doing something). Because the pages of Errant Story are small and dense, there’s not a lot of negative space for large bubbles with a lot of text. Instead, text is routinely broken up into phrases so that the bubbles can be moved and distributed around the art in what little negative space there is. However, this runs into a lettering issue. Traditionally, dialogue which trails off and begins in another bubble ends in ellipses in the first bubble, and starts with ellipses in the next. I scrapped this, because the result was a whole lot of ellipses needlessly taking up precious page space and introducing unnecessary visual pauses into the dialogue. Instead, dialogue which trails into the next bubble ends with ellipses, but the subsequent bubble begins without them. I figure our readers are smart enough to follow that, especially since it’s pretty close to literary grammar. I eliminated the double dashes in Errant Story for the same reason I eliminated the secondary ellipses: to save room, and bring the lettering back towards a literary standard of grammar. I’m sure the original reason for the double dash had to do with the difficulties inherent in hand lettering, and I’ve done enough of that to sympathize, but Errant Story is not hand lettered. The ideal in moving to digital lettering is to mimic the feel of hand lettering, but without slavish devotion to the restrictions it created. Errant Story doesn’t have a seventy year history of lettering style to match, so I feel no remorse whatsoever about bidding the double dash adieu. In Errant Story, we only ever see one type of caption, for locations or times. These always appear in a shadowbox, in a specific font, in mixed caps. At one point in the story, Sarine is going to spend a ridiculous amount of time talking about the past. These are not, strictly, narrative captions, so they’ll appear in their own unique format to indicate that they are voiced over the art. Traditionally, the letter I only appears with crossbars when it is a personal pronoun or part of an acronym. This is one of those comic book lettering conventions that I understand from a lettering perspective but loathe from an editing perspective. In this case the editor in me teamed up with my lazy side and won, and consequently anytime an I is capitalized in Errant Story it appears with the crossbars. To do otherwise would require either manually dropping the letter into lowercase anytime it would be required, or routinely typing it in lowercase within the script. Neither is something I feel to be an acceptable use of my time. Traditionally, dialogue that isn’t coming from a character on screen (as it were), ends in a tail to direct the reader’s attention off panel or to the point from which the dialogue is originating. Again, Errant Story has small, dense pages (because in Poe’s head letters don’t take up any space, much to my continued annoyance), so there’s usually no room to do this. Instead, any dialogue bubble that can’t be directed to the character doesn’t have a tail at all. There are a couple exceptions, but generally we assume the readers are smart enough to figure out who’s speaking and follow the dialogue without that little cue. Errant Story has small, dense pages, and all the art is against a black page background. Butting bubbles up against borders (which is preferred for most books) makes no sense in that context, so all bubbles in Errant Story break the borders of the panels. I feel that keeps the eye moving across the page better, as well, though I might feel differently if the pages were on a white page background and had a lot of negative space to play with. There are all kinds of rules about how and when to use quotation marks in a comic book, and they’re good rules… but rather than pay them any attention, I have done my level best to eliminate quotation marks from Errant Story dialogue altogether. I personally think they’re ugly and there’s no very good reason to include them in dialogue lettering, as we rarely speak with them in life. The exception is when a character is speaking in a way that clearly calls for air quotes. Everything else, I’ve found a way to work around that I think is just as clear. The traditional approach to indicating dialogue in another language is to enclose it in chevron brackets. I kept that, but also decided that in Errant Story, the elves are hoity-toity enough to demand their own special font, which is something that is not always done. I then spent hours swearing and trying to find a font that was both arrogantly old fashioned and still legible as a dialogue font. In Errant Story there is also a special font dedicated to reading or rote recitation. This appears without brackets, because it’s meant to only indicate a change in the character’s tone. Telepathy in Errant Story is kindof a nightmare from a lettering perspective, but mercifully one that doesn’t come up a lot. I eventually settled on an italicized dialogue font inside a bubble with a drop shadow and a bracket of smaller (also drop shadowed) bubbles. The drop shadow is color coded to the “speaker.” This is nothing like the usual telepathy bubbles you might see, but I think it manages to be clear. The above list is the only set of lettering changes you’re likely to see on the page, but we’ve also made a lot of non-conformist decisions about our editing and lettering process. For now, though, all this rebellion has about worn me out, so I’ll have to talk about those process decisions in another post. Sorry, but today’s page is a bit delayed. A mouse somehow kicked all our asses today.